– Egyptian Muslim Brotherhood president Muhammad Morsi prays Eid Adha prayers protected by 5,000 soldiers & 30 armoured central security vehicles. – 10 lines of security forces behind him to protect his ‘prayers’, girls from his political party ‘Justice & Freedom’ inspect ladies going for prayers. 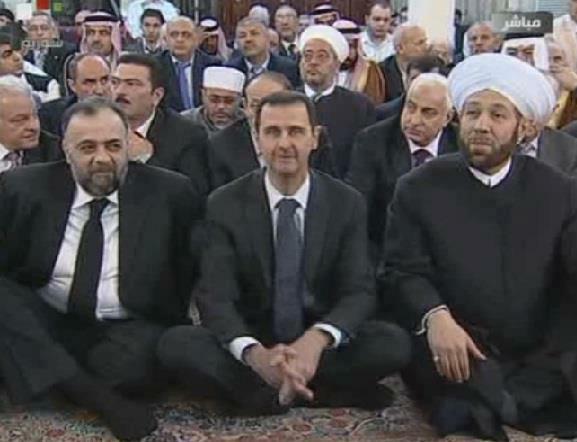 In the meantime, Syrian president Bashar Al Assad prays at Al Afram mosque in Damascus, enters with the worshipers from the same door, surrounded by the local residents of the mosque and state officials on his sides.